The IceCube experiment, which was finalized in December 2010, consists of a cubic-kilometer array of 5160 photomultipliers located 1450 - 2450 m deep in the ice at the geographic South Pole. The phototubes detect Cherenkov light produced by muons and other charged particles. The challenge is to find neutrino induced muons, electrons and taus among the million times larger background from muons produced by collisions of charged cosmic rays with the atmosphere. Neutrinos are on the way to become a powerful tool for astrophysicists. Due to the extremely small cross section for weak interactions, neutrinos are able to leave compact sources and provide the observer with information from inside. Therefore they can provide insight into the surroundings of supernovae, active galaxies or other "cosmic cataclysms". Being electrically neutral, no galactic or intergalactic magnetic fields affects the trajectory of a neutrino. They pass interstellar obstacles like dense clouds that are impenetrable for photons. In case of a charged current interaction, a charged lepton is produced, which on average receives about two thirds of the neutrino energy. Traversing the ice, the muon emits Cherenkov light that can be detected by photomultiplier tubes. The detected photon arrival times and amplitudes are used to reconstruct the track and locate its source in the sky. Due to the selected distances between adjacent phototubes, IceCube is most sensitive for muons and their corresponding neutrinos with energies above a few hundred GeV. In 2013, IceCube discovered cosmic neutrinos for the first time and is now eagerly waiting for the first evidence of neutrino point sources. With time, the analysis techniques have substantially improved, allowing for analyses that survey the sky with all neutrino species. 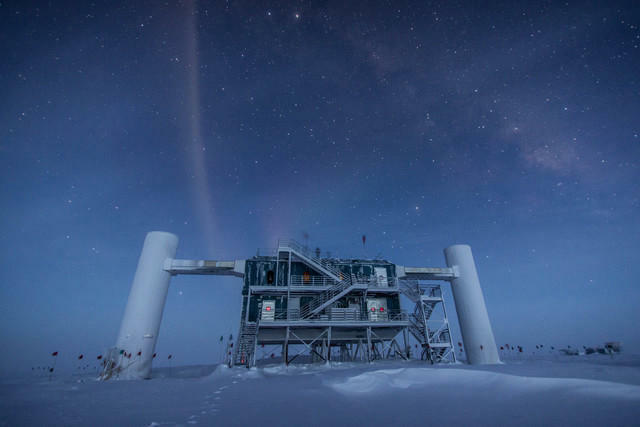 At lower energies, IceCube is competitive with accelerator based experiments in the determination of neutrino oscillations, the search for sterile neutrino or for non-standard neutrino interactions. IceCube plans to extend the IceCube observatory (IceCube-Gen2) by increasing the detection volume substantially to study cosmic neutrinos in detail, by lowering the energy threshold to a few GeV in order to determine the neutrino mass hierarchy and precise measure neutrino oscillation parameters and by covering the surface with a large detector to veto cosmic ray muons and to study cosmic rays. 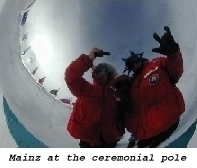 The University of Mainz joined the earlier AMANDA experiment in June 1999 and now participates in the Icecube experiment, together with about 300 scientists from 49 institutions and 12 countries. We have made essential contributions to the directional and point source reconstruction techniques, the development and upkeep of a part of the data acquisition, the development of statistical tools for oscillation and flux unfolding analyses techniques, as well as many contributions to analyses, such as indirect dark matter, GRB, point source and supernova searches, cosmic neutrino flavor tagging and neutrino properties. The work at Mainz has been supported by the BMBF, the DFG, the HAP - Helmholtz Alliance, the EMG research center, the PRISMA Center of Excellence, and the Johannes Gutenberg University.